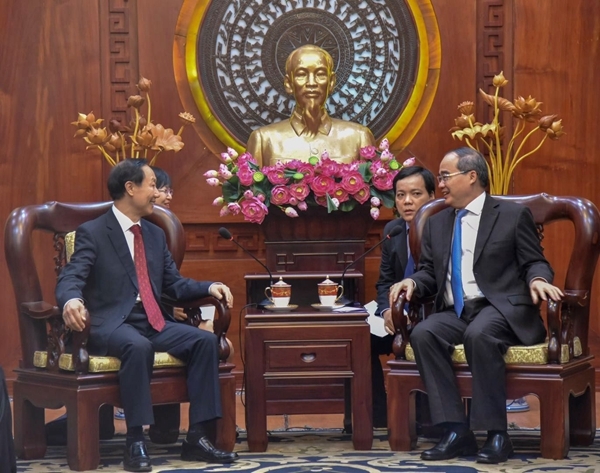 Visiting Chairman of China Soong Ching Ling Foundation (CSCLF) Wang Jiarui met with Ho Chi Minh City's Communist Party Chief Nguyen Thien Nhan, and General Secretary of the Communist Party of Vietnam (CPV) Central Committee Hoang Binh Quan in Ho Chi Minh City (HCMC), Vietnam on April 1, 2019. Nguyen Thien Nhan warmly welcomed Wang Jiarui and introduced the economic and social development in HCMC in recent years. He said that Comrade Ho Chi Minh had spent 30 years in China, and added that HCMC always had a special affection with China. "Vietnam sent a group of students to study in China in 1950s. I also studied in China in the 1960s. We will always remember the concern and support of the CPC and the Chinese government for Vietnamese students in China and will maintain a special relationship with China at all times," said Nguyen. Nguyen Thien Nhan thanked Wang Jiarui for his contributions in promoting Vietnam-China friendship over the years, and expressed willingness to strengthen exchanges and cooperation with the CSCLF. "As a leading city in Vietnam, Ho Chi Minh City has the responsibility to make greater contributions to the future of Vietnam-China relations," Nguyen said. "We are willing to strengthen exchanges and cooperation with the CSCLF so that the young people of the two countries can enhance mutual understanding and continue to pass on their friendship over the generations." Wang Jiarui said that in recent years Ho Chi Minh City, with its rapid development, had played a leading role in Vietnam. He said that China and Vietnam are close to each other, and the high-level exchanges between the two countries are the cornerstone of bilateral relations. "China and Vietnam must not only strengthen cooperation at the economic and trade levels. The two sides must promote exchanges at the social level and strengthen people-to-people exchanges, so as to implement the consensus of the leaders and jointly consolidate the public opinion base of bilateral relations." Said Wang. Wang further pointed out that youth is the future of the two countries. He stressed that both sides must inherit the traditional friendship forged and nurtured by the older generation of leaders of both countries, and pass it on to the next generation. Wang added that the CSCLF is dedicated to youth development and has engaged in international exchanges for young people. He said the Foundation is willing to strengthen cooperation with Ho Chi Minh City, promote friendly exchanges between China and Vietnam, and make new contributions to promote Sino-Vietnamese friendship. Later in the evening, Wang Jiarui also met with the General Secretary of the CPV Central Committee Hoang Binh Quan. The two sides expressed their common will to promote people-to-people exchanges between the two countries and promote Chinese-Vietnamese friendship. Chinese Ambassador to Vietnam, Xiong Bo; Vice Chairman of the CSCLF, Yu Qun and Consul General of the Consulate General of the People's Republic of China in Ho Chi Minh City, Wu Jun also attended the above-mentioned activities respectively.